DON'T BE TIM. LET US HANDLE YOUR PAYOUTS. LeagueSafe is the trusted source for collecting and protecting fantasy league dues. In business since 2008 and with an impeccable "A" Better Business Bureau rating, we're the only fantasy sports consumer protection agency on Earth. Commissioners love being able to collect league dues online and pay league winners out within hours of the end of the season. League members have the convenience of online payments and, most importantly, peace of mind. With LeagueSafe, your league funds are safe and secure all season long. 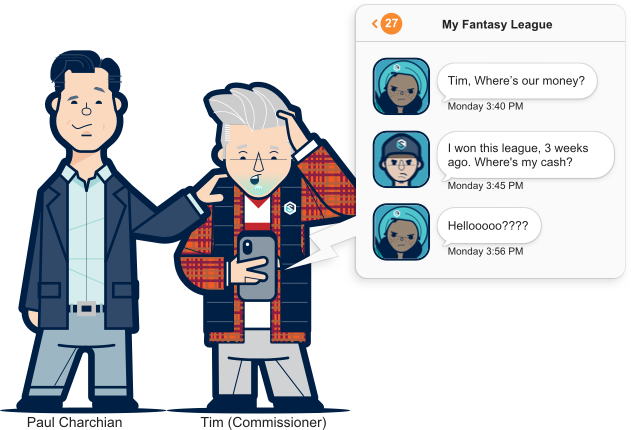 LeagueSafe has eliminated the last headache in running season long fantasy leagues. No more chasing down buddies or leaguemates for cash, IOUs, or checks. Setup is a breeze, and LeagueSafe can be used for free from start to finish. Collect payments online or via mobile, and assign winnings within hours of the end of the season. We'll even nag your unpaid league members for you. LeagueSafe is the only online payment solution that offers safeguards for your season long fantasy prize pool. Pay safely and securely via credit/debit card or e-Check (electronic bank transfer), and once the season starts your funds are on lockdown. Nobody, not even your commissioner, has access to league funds until the season ends. Don't know or trust everyone in your league? Take advantage of our voting mechanism to ensure league members have a say in how end-of-season winnings are divvied up. With free payment and payout options, you can't go wrong with LeagueSafe.